This is a printed hard-copy version of the NZ Car Construction Manual and includes all sections and chapters in a ring-binder. This is a full downloadable version of the NZ Car Construction Manual which includes all sections and chapters in one single, searchable electronic file. This chapter provides you with the basic history and principles of the low volume vehicle certification system in New Zealand. This chapter provides some useful information that will help you to use this manual, and to get through the LVV certification process with the least amount of stress possible. 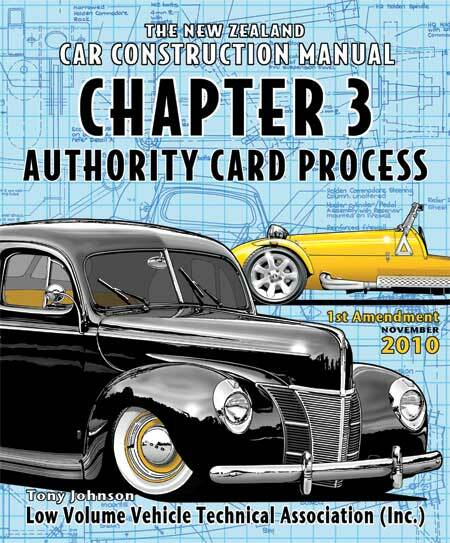 This chapter contains information and application forms for NZ Hot Rod Association, Motorsport NZ, and NZ Drag Racing Association LVV Authority Cards. This chapter provides all relevant details and application forms for build, design and concept approvals used in the build approval process. This chapter covers the design, modification and construction of all common chassis types. This chapter covers the modification, construction and installation and of all commonly available suspension systems. This chapter covers component selection, compatibility, geometry, and column collapseability in the event of a collision. This chapter covers all aspects of efficient, reliable, and durable braking systems in low volume vehicles. This chapter covers installation, attachment, noise, vibration and harshness reduction, along with the long-term vehicle reliability. This chapter covers fuel tanks, tank location, attachment, venting, spillage and leakage dispersal, along with hoses, pipes and fittings. This chapter will be introduced as an update in the future. Refer to LVV Standard 90-20 (Exhaust Noise Emissions), and LVV Standard 90-10 (Exhaust Gas Emissions) both freely available from www.lvvta.org.nz. This chapter covers wheels & tyres, ensuring correct selection, fitment and function. This chapter covers aspects of includes frontal impact, door retention systems, and external projections requirements. This chapter covers seats and seatbelts, and their attachment to the vehicle structure. This chapter covers glazing types, rear view mirrors, engine hood protrusions, and washing and wiping systems. This chapter covers a vehicle’s interior surfaces, fittings, and controls which can have an affect on occupants in the event of an accident. This chapter covers all lamps that are added, substituted, or modified, and their installation on a low volume vehicle. This chapter covers all fastening systems, including welding requirements, non-destructive testing requirements, and all fastener requirements. This chapter covers vehicle operation, to ensure that it is stable, safe, and user-friendly enough that any competent driver could get in it and drive it safely. This chapter provides some background into the early beginnings of the Low Volume Vehicle system in New Zealand. This section acknowledges the many people involved in the initial and ongoing development of the NZ Car Construction Manual. 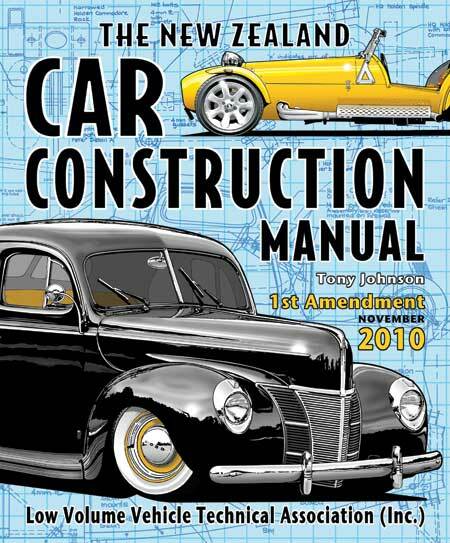 This section provides some background on the Author of the NZ Car Construction Manual, Tony Johnson. This section provides a list of Terms and Definitions relevant to the NZ Car Construction Manual.